I’ve got a chest freezer and love it. But I don’t love how hard it can be to put my hands on the package of chicken thighs or the bag of frozen peaches. I also find that I forget what’s in there and often come home from Costco with a giant bag of frozen blueberries when I’ve already got a bag in there. I had tried my hand at making a freezer inventory two summers ago when our garden produced way too many green beans and I had hours on end to peel, slice, flash freeze, and bag peaches (August + teacher + no kiddo). I wrote up a great spreadsheet and marked off how much of everything I had but then I never updated it. And when I looked at the printout thinking I had a dinner’s worth of sliced steak in a neatly labeled freezer bag (which I did at one point), our beef stroganoff ended up being mushrooms and pasta with cream sauce. Stay within your food budget: buy in bulk when items are on sale and freeze until you use them in a meal. Meal plan effectively: when you are planning a week’s worth of meals (how we roll), you know what you already have on hand. 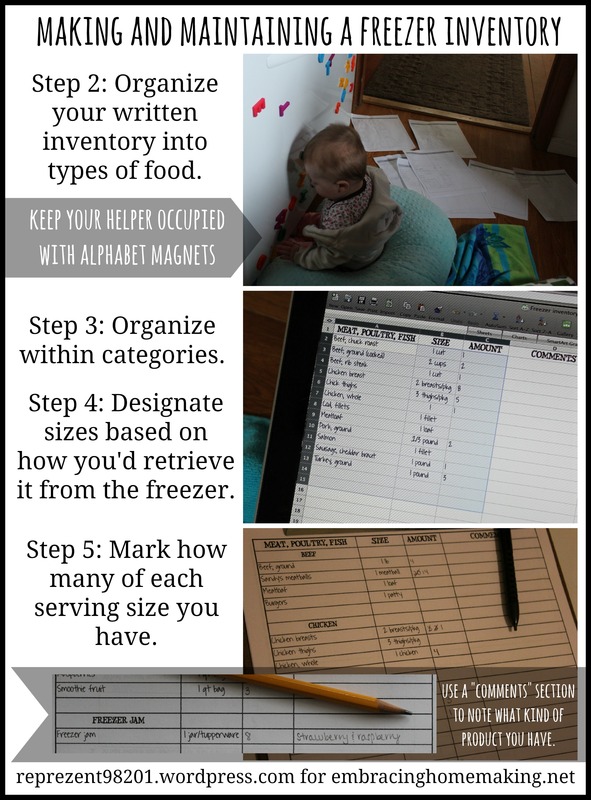 This is really great if you used up a good portion of your monthly food budget (what we do) buying in bulk the previous week. Store with confidence: foods get eaten in a timely manner before they get freezer burned, too old to eat, etc. Avoid overbuying: you don’t purchase something you already have, especially if you need to stick to a food budget. If you’re also using this as an opportunity to clean your freezer, put everything in a cooler/another freezer and take a few hours to defrost it. For us impatient folks, take the pancake flipper to the ice to hurry up the process. While you’re at it, toss anything older than a year or that you don’t see yourself eating. Freezer burned ground pork, anyone? You can use the “Comments” to note what kind of product you have: i.e. raspberry and strawberry freezer jam. 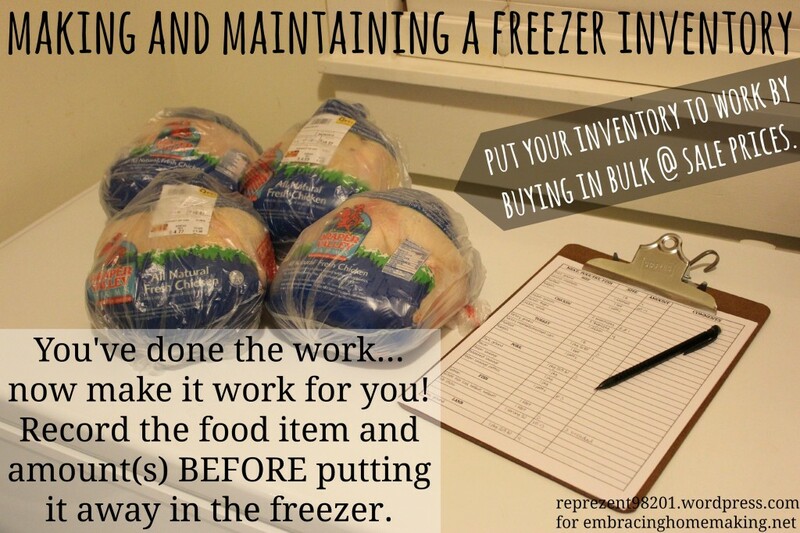 Total time: 50 minutes to an organized freezer! And since the first step is the only non-paper/part, you can spread out the rest when you have time (or tackle it all at once, of course). 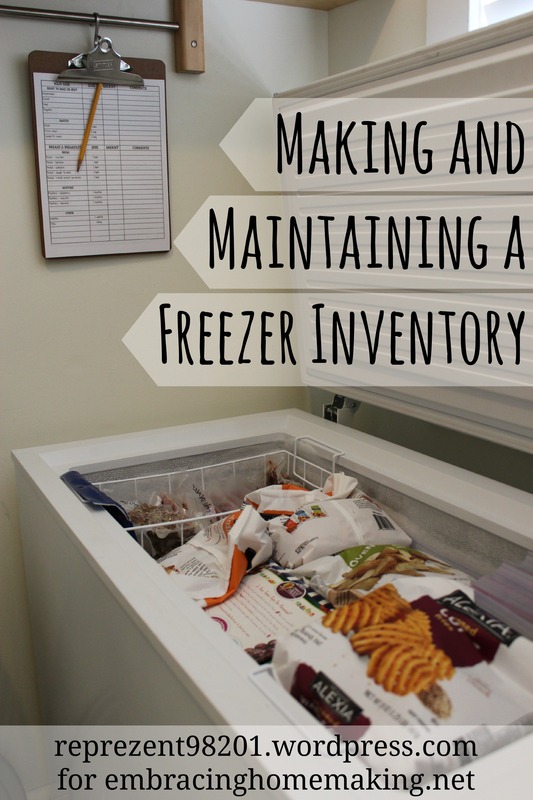 The key for maintaining a freezer inventory is to be consistent. For me, that means having the list on a clipboard hanging right next to the chest freezer. Whenever I get home from the store, I mark down what I purchased before it goes in the freezer. I’ll use this round of print outs until I don’t have any more room to write on it. You might want to keep it electronically or print a new one out sooner than that. I’ve found that if I use a pencil, the OCD side of me is more willing to write on it and actually use the inventory because I can always erase an entry when amounts change and/or erase my sloppy handwriting if I need to get things in the freezer quickly. So…grab your favorite hot drink (chai for me! 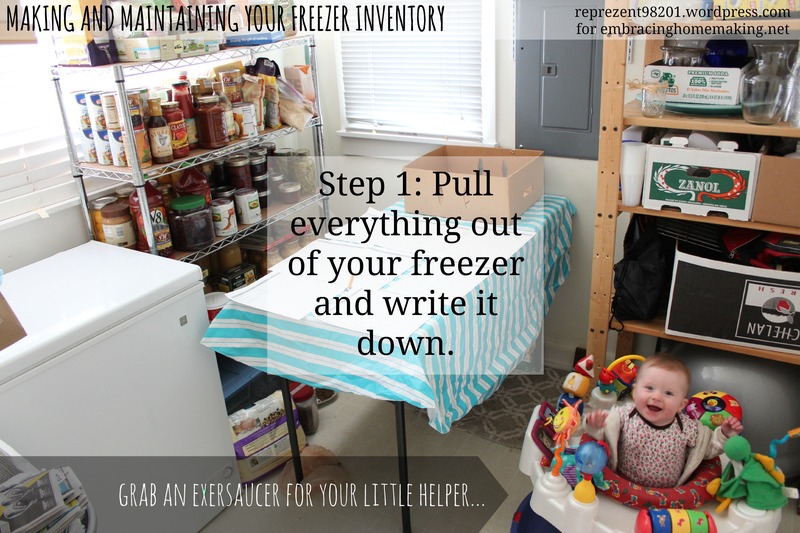 ), a friend or an exersaucer to watch the kiddo(s), and get going on that freezer inventory. If you don’t want to make your own, you are welcome to the PDFs I made for myself (below). If you discover any tips/tricks, please post them in the comments. I’d love to hear how this goes for you! Comment below or fill out the form to email me! Rachel Zupke is a stay at home mom permanently on hiatus from teaching high school science. With Christ's strength, you'll find her chasing after her newly crawling baby girl, crafting/sewing, supporting her hard-working husband with delicious frugal meals, and learning the ins and outs of making their 103 year old house a home. In her *spare* time, she coaches basketball and rowing. Rachel blogs at RachelZupke.com. LOVE banana nut muffins!! They are our FAVORITE! Yum! This looks so good! I love banana bread and have been thinking about making some but maybe I’ll make this instead. I pinned it so I can remember to give it a try. Yummy, those looks completely delicious! Thanks for the recipe! This recipe is awesome. I had some bananas to use up and this made a dent. I made a double-batch and frozen some! I’ll make this one again! I love banana nut anything. Your muffins look yummy. I just pinned them on Pinterest! mmm banana nut muffins and bread are my weakness! Umm… YUM!! Looks delish, Ash! I so need to do this! I can never find anything in my chest freezer. thanks for the great tips, I am sure this will help me with my freezer. great tips- i need this for my freezer!! I love freezing stuff. It’s so nice to have good food in the freezer, especially for busy nights. Our freezer is packed to the brim so I always wonder what is at the bottom, lol! Great info!! I really need to work on a freezer inventory- I rarely use anything in it because I don’t remember what’s there! Great tips! It’s always important to clearly label and date things when stocking up. Why didn’t I ever think to do this? I am constantly forgetting what I have in my freezer and then stuff goes bad. This is awesome! Totally…don’t want $$ to get thrown out! Very comprehensive – I love this! I don’t have a standalone freezer, but I have a pretty spacious freezer portion in my fridge. I try to avoid packing the freezer too much because we’ve been known to have really bad winter storms and long power outages in my area – there hasn’t been a long power outage for several years, but I know lots of people who lost $500 or more in meat when the power was out for 4-7 days, so I think we’re all still traumatized from that, LOL! Canning is a great idea – I’ll bookmark that post for later! Yeah, we had hurricane force winds here in 2007 – I lost power for about 4 1/2 days and some people in the area lost it for up to 2 weeks. Luckily I was able to take all the food out of my freezer and cook it on my grandma’s grill to share with family and friend, so it didn’t go to waste! Mine is on the back porch. Maybe not as efficient, but that is the only place I had!